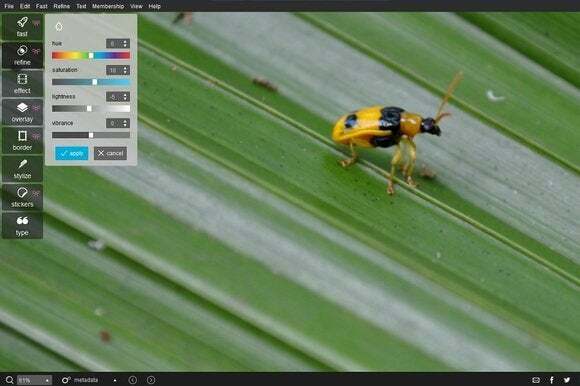 Windows and Mac users in need of a free photo editor can now download a desktop version of Pixlr. The popular web app is now available as standalone software, no longer requiring an Internet connection to use. But be aware that the free version isn't quite the same as as what you get online. In many ways, the desktop software is similar to the web-based Pixlr Express. Users can crop, resize and rotate images, adjust color and contrast, apply red-eye reduction, or just use the “auto-fix” button. The app includes dozens of filters, overlays, borders, effects and stickers as well. Pixlr also added some new features and effects to the desktop version, such as a “double exposure” tool for laying photos on top of phone another. And as a desktop program, Pixlr can handle high-resolution, uncompressed images while preserving EXIF data. The text overlay tool can also use all your system's existing fonts. Not all of Pixlr Express' features made it to the free desktop version, however. You can't doodle free-hand on top of photos, and the somewhat amusing “liquify” tool is missing. And while the app is free to use, Pixlr intends to put some extra features behind a $2 per month or $15 per year paywall. For now, the premium version includes a set of masking tools, called the “Influence Panel,” that lets you apply effects to just a specific part of a photo. Meanwhile, Pixlr's full-blown Editor remains online-only (and completely free). So if you need a free alternative to Photoshop with layers and free-hand drawing tools, you'll have to stick to the web app.